Mindy and Danny, a modern American twist on Bridget and Darcy (hypable.com). 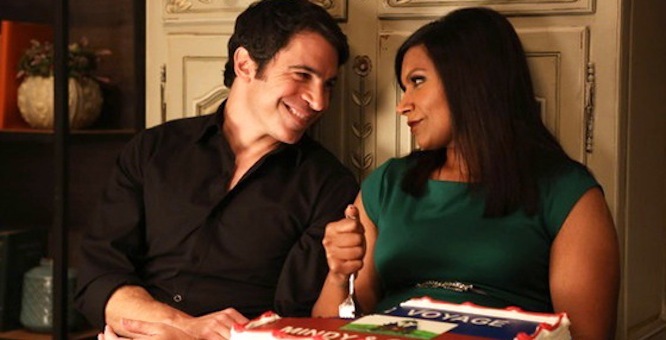 Hooray for Hulu’s deciding to pick up season four of “The Mindy Project”! Fox made a disappointing call in canceling the show earlier this month, but at least they’re doing fans a solid, offering all season three episodes online in advance of the transition. Hallowed Hulu, meanwhile, has saved us all from having a hole in our weekly entertainment schedule, now that they’ve ordered 26 new episodes of the hilarious sitcom. The show has been fundamentally appealing. Yet somehow it has never quite found the audience it should have, which includes everyone who appreciates quality rom-coms and anyone who likes laughing. An American twist on Bridget Jones, Mindy is a successful 30-something New York City professional, always looks polished and is often glamorous. But she’s a bit of a mess in the romance department. Still, she’s always trying. We respect and relate to that. Mindy spent the first two seasons on a seemingly endless romantic quest. She’s a relatable and likable character, even as we notice her various flaws. So, we root for her, as she stumbles and bumbles her way through relationships with guys who initially seem great and later reveal themselves to be lame, or worse. Kaling is a huge rom-com fan, and you can see that’s influenced the show. For example, Dr. Mindy Lahiri and her OB-GYN colleague-turned-boyfriend Dr. Danny Castellano finally get together in an episode that evokes “An Affair to Remember’s” Empire State building focus. And when both doctors are hospitalized for meningitis, Danny visits Mindy’s room to cuddle and read “Bridget Jones’ Diary” to her, British accent and all. This, of course, is a sop to Mindy; grumpy divorcee Danny would never read Bridget independently. Perhaps more importantly, this is the only show on TV in a very long time that’s made me constantly laugh out loud. You actually felt good after watching it, like everything had lightened up a bit. Other comedies on TV seem geared toward men and a frequently juvenile male sensibility; I just don’t find them funny. “The Mindy Project,” by contrast, never seemed embarrassed to appeal directly to women’s sensibilities. The show cast eye candy like Tommy Dewey and Chris Messina (who plays Danny) as romantic leads, rather than sexual conquests. The show has also successfully mined the comedy gold inherent in attending an ex’s wedding (a favorite rom-com setting). Not once but twice, Mindy has ill-advisedly attended the weddings of her ex-boyfriends and caused a scene. The writing team has also capitalized on Messina’s dancing talent. Part of his backstory is “Diamond Dan,” the successful stripper alter ego that funded Danny’s medical education. If the show has any blemish, it’s been the writers’ decision to constantly alter the characters and plot. For example, Mindy’s best friend, Gwen, who was so important initially quickly disappeared. This season, we lost the engaging Dr. Peter Prentice to a life in Texas. The third season’s surprise pregnancy story arc—Mindy realizes she’s carrying Danny’s baby while doing a medical fellowship at Stanford University—also felt like a Hail Mary pass. In the same way Mindy seemingly dangled the Stanford fellowship to nudge Danny to commit, the writers introduced a mini Lahiri-Castellano, hoping viewers would commit. The “Mindy” team needn’t try so hard; rushing Mindy and Danny from early dating to pregnancy felt forced. It didn’t feel true to the characters and, demographically speaking, it wasn’t terribly believable. Danny has long been been portrayed as a serious Catholic, so his cavalier attitude about an unwed pregnancy struck a false note. Danny isn’t Hollywood; he’s classic New York Italian. All of this might have prompted channel changing with another show. But I felt so attached to Mindy’s character, I was willing to forgive the huge lurches in character and story. In an era when Hollywood constantly cranks out subpar romantic comedies with predictable, bland plots, it’s refreshing to watch a show that takes the genre seriously. The audience benefits because Kaling, the force behind the show and its lead actress, is also a rom-com fan. Her final product is not only watchable, but loyalty-inspiring. The writing is clever and the acting engaging. We root for Mindy and Danny. We want them to overcome their various personal issues and find happiness together. Here’s hoping they find their happy ending, while continuing to make us laugh, during season four.